Ir. clár can mean both a plain and a board. In the latter sense it can refer to a plank-bridge in some place-names. Thus Derryclare, from Ir. Doire Chláir, could either mean 'oak-wood of the plain' or 'oak-wood of the plank-bridge'. The name seems to have been transferred by the Ordnance Survey from the townland of Derryclare situated to the east to the mountain itself. In this respect the Ir. name Binn Doire Chláir makes much more sense as a mountain name. Binn Doire Chláir is the 151st highest place in Ireland. Binn Doire Chláir is the second most easterly summit in the Twelve Bens area. A majestic mountain situated at the finish (or start) of Glencoaghan Horseshoe. 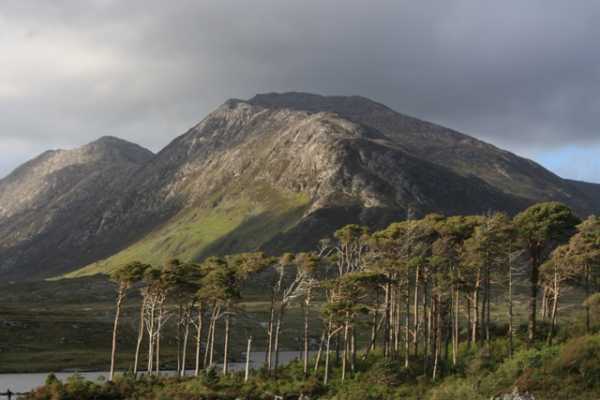 It commands a fine view of the Glencoaghan Valley and the myriad of lakes in the plains of Connemara. Its distinctive sharp southern ridge is visible from the N59 Galway – Clifden road. Derryclare is formed from quartzite and its upper slopes are comprised of shattered rock that require care to negotiate. There is room for a few cars at L806 488 A. Head east over pastures, climbing gently towards the southern ridge. The ascent to the summit becomes a steep haul, initially over peat and heather, before attaining the rock of the upper reaches. A number of false summits are passed before the small pile of rocks that mark the summit are reached. At L81489 51077 B. Particular care is required in the initial steep section above the pastures as a few crags and rock outcrops are negotiated. Also keep to the east of the ridge to stay well clear of sharp drops and plunging cliffs.